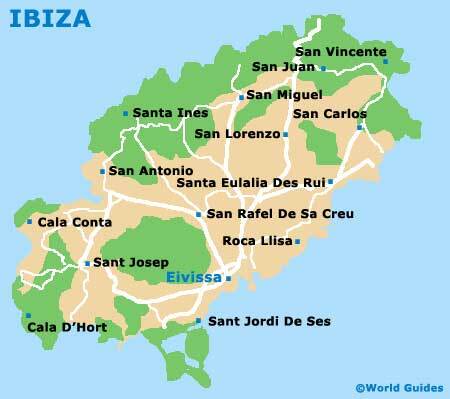 There are a large number of religious buildings to be found on the historic island of Ibiza, with old churches residing within the majority of the towns and principal villages. Good examples are sited within both San Antonio and San José, the latter of which is home to the Iglesia de la Madre de Dios del Carmen. Standing high above the Old Town district of the island's capital, Ibiza Town, the elevated Catedral de Santa Maria boasts a lengthy heritage, being built in the early 13th century and featuring a series of no less than five chapels dedicated to local saints. During the early 18th century, the church underwent much-needed renovation work, between the years of 1715 and 1728, which restored it to its former glory. 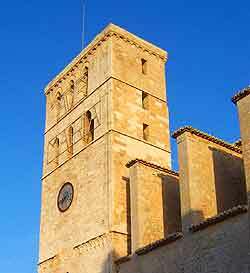 In 1782, Pope Pius VI decreed that this grand medieval church was important enough to become known as a cathedral and the Episcopal seat of Ibiza was established at this time. Visitors will discover a wealth of art works on display, including some historic Gothic panels depicting St. Anthony and St. Tecla, painted in the 16th century and remaining in good condition. The grand Santa Maria Cathedral stands in the historic part of Ibiza Town. Highlights include a museum, chapels, a tall bell tower and a holy cross made from gold and silver over 600 years ago. The cathedral is located in the Dalt Vila area of the capital, where it is without doubt the most impressive building. Of note, mass is celebrated here every Sunday and reliably draws large crowds. The 14th-century Capilla de Santa Inés is full of history and is home to the statue of Santa Inés. It is believed that this large, famous statue arrived by boat during a fierce storm. A festival is held every year at the end of August celebrating the saint. The Santa Inés Chapel is located close to San Antonio and is easy to reach by bus. Dating back to the 15th century, the Iglesia de la Madre de Dios de Jesús has many interesting features. This church is well-known on the island for its religious paintings, including the Altarpiece, which was created in the 16th century. Mass is held here on Saturdays at 19:00 and on Sundays at 12:00. This church is fairly modern and was constructed in the mid-20th century. The Iglesia de la Madre de Dios del Carmen has been cleverly designed to blend with the traditional architecture of the island and is easy to reach by bus. Mass is held here every Sunday at 17:30.